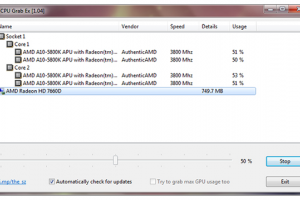 "CPU Grab Ex | Portable CPU annex GPU stress testing tool"
The freeware product reviewed here is called CPU Grab Ex. CPU stands for central processing unit, a core component of your computer responsible for carrying out the instructions of programs by performing what these specify. You might for example have an Intel chip annex CPU on your computer’s motherboard and the program you can download here will enable you to stress that CPU. As such, CPU Grab Ex is a hardware stress testing tool that can be used for benchmarking and testing purposes. It enables you to go beyond the normal situation which might be done for various purposes, such as to see whether your CPU annex system meets up to its specifications, to determine whether it is safe to use for a specific demanding purpose, among others. Stress testing is performed for software and hardware and this application is aimed at increasing the demand on your computer’s central processing unit or CPU as explained in this article’s introduction. Stressing the CPU will slow down the system and with CPU Grab Ex’s CPU grabber this will be achieved because it will lead to an increase in CPU power consumption. As such, this utility, aimed at the more experienced computer users among, you will enable you to demand more from your CPU than normally would occur. It will allow for example to check your central processing unit’s cooling. Furthermore, with CPU Grab Ex you’ll also be able to increase the demand on your graphics processing unit or GPU, on the condition it’s an Open Computing Language or OpenCL compatible graphics card. CPU Grab Ex is a single standalone executable that doesn’t require any installation to be performed. As such, it might be considered portable and can be executed straight from the location it’s stored, be it on a removable USB drive or a cloud storage drive, anytime and anywhere as long as it is launched from a compatible computer annex operating system. Alongside this article you can find a screenshot of its graphical user interface. CPU Grab Ex only consists of a single application window in which the detected hardware items will be displayed by name, providing additional information about vendor, speed, details and usage percentage whenever available. The usage percentage shown is updated constantly and underneath the display area you’ll find a slider with a dedicated grab button alongside it. This slider serves the stress or demand percentage setting according to your testing scenario or requirements. Finally, one can mark a checkbox for two items, namely to automatically have CPU Grab Ex check for updates and to try to grab max GPU usage too. Note that this executable can also be launched from the command-line, hence its functionality can be used from batch files. For example adding the /u 60 option will set the slider to 60 percent and /s will start CPU grabbing when starting the application. CPU Grab Ex is a simple yet powerful free portable CPU annex GPU stress testing tool advanced computer users might be interested in adding to their dedicated toolkit.